Palmer's has been a source of many of my drugstore buys, body care finds and of course skin care finds over the years. Now they've created a gently, effective hyper pigmentation solution called Palmer's Cocoa Butter Formula Eventone Dark Spot Corrector. The Hydoquinone-free treatment features Palmer’s tone enhancing complex, which includes cocoa butter, niacinamide, soy, licorice extract, synovea, songyi mushroom, a Japanese mushroom extract known for its pigment-perfecting properties to visibly improve discoloration with regular use and vitamin C.
The texture is a gel/cream hybrid which is very lightweight and absorbed very quickly into my skin. The formula was also gentle on my skin and didn't cause any irritations or breakouts. Because it also includes cocoa butter, what I loved is that is served to moisturize my skin as well, so on many days I didn't even need to use an additional moisturizer. It should be noted that it also has the "Palmer's" cocoa butter scent upon application, but it dissipates very quickly as well. This is a good treatment for medium to light dark spots, as, with many hydroquinone-free products, it's not quite as strong and does take a few weeks to begin seeing improvement. 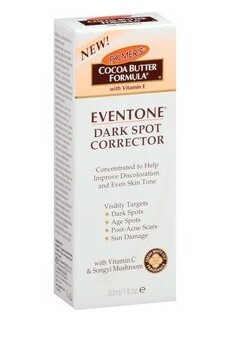 After using AM and PM for about 3 weeks, I did see significant improvement in a few medium/dark spots on my cheek area. *This product was provided courtesy of Palmer's PR for reviewing purposes.